of advanced dementia through stimulating games, music, and crafts. Ryan is not a robot, it is a friend, an assistant, and a constant companion. Ryan is a social companion for dementia patients who delays the onset of advanced dementia through stimulating games, music, and crafts. Social robotics is all about human interaction and conversation – We’ve got it down to a science. Emotional recognition allows our robots to empathize and understand the full scope of a conversation. 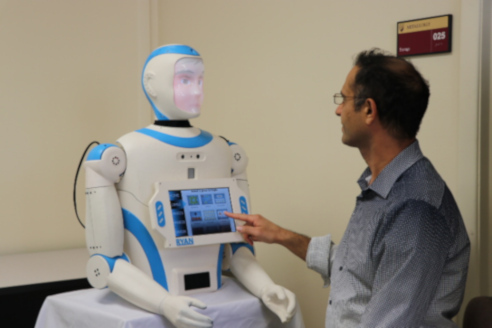 Our robots are able to express lifelike human emotions and behavior. They are also able to speak their minds. Our robots use the information that they receive to read a situation and act autonomously to do the most good. 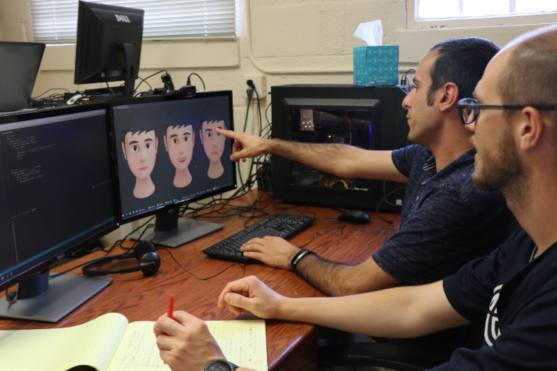 We’ve combined intelligent perception, emotional recognition, facial animation, natural language processing, and human expression to create DreamFace Tech. DreamFace Tech is powered by our team of passionate engineers and developers. Do you have what it takes to join the DreamFace family? Born from a decade of research conducted in the Computer Vision and Social Robotics Lab at the University of Denver, we continue to pioneer the field of Socially Assistive Robotics (SAR). The uses of our technology are endless and we continue to push the limits of what is possible. We don’t create robots, We build companions. Are you looking to be notified when DreamFace Technologies has employment opportunities available? Do you want to get more information about purchasing our technologies? Perhaps you have an establishment that could benefit from employing Ryan. Regardless of your inquiry, click the button below to connect with the DreamFace Technologies team. We look forward to talking with you.